We can't fly like eagles but we can see the world from the eyes of an eagle from an airplane. Seen from above, even the familiar can look different - a new point of view. My work took me to different parts of the world. This post is about some special memories related to air-journeys. It is accompanied with some of my favourite pictures clicked from airplanes. The first image of this post (below) is of old Italian rural houses with fields, trees and towers. It was clicked close to the Fiumicino airport of Rome in Italy. One of my most thrilling air journey was in China in 1989. It was the end of May and we had taken a flight from Kunming to Beijing. On the way our plane had problems and we were forced to land in Xian. As we went to a hotel in Xian, we passed a big protest march in the city. A leader called Hu Yaobang, who was very popular with students, had died. Two days later, our plane was repaired and we reached Beijing. As we crossed Tianamen square, we saw groups of people protesting there. We were told that these were student protests. On 3rd June, I left Beijing and flew to Orlando in USA. In the hotel I was shocked when I saw the news about the tanks in Tianamen square. It was also a close brush with an event whose echoes had reverberated all over the world. Except for a couple of pictures of students in the Tienamen square, I didn't take many pictures during that fateful journey - I regreted it afterwards. 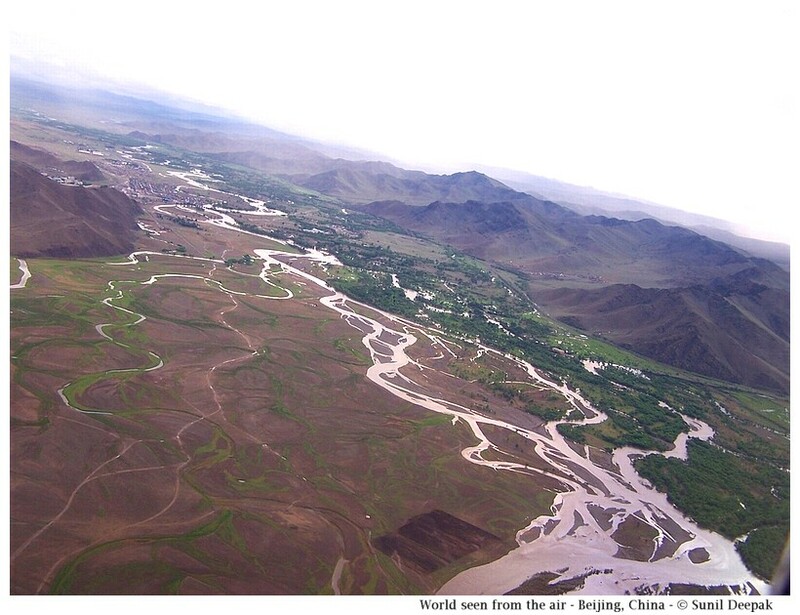 The image above shows a river near Beijing airport in China, it was clicked many years later. The next couple of images are near the Guwahati airport. The first shows Brahmaputra river and the Saraighat bridge. On the right side of the river, you can see Neelachal hill that hosts the famous Kamakhaya temple. On the left side you can see the IIT Guwahati campus and in the middle of the river, the tiny island with the Umananda temple. The next image is also clicked near Guwahati and shows a vast area covered by the Brahmaputra floods. The next two images are from north-east of Brazil. The first is from Santarem. You can see Avenida Tapajos along the Tapajos river and the famous Metropolitan Cathedral of Our Lady of Conception painted in light blue colour. The second image was clicked closer to Belem and shows one of the mighty strands of Amazon river going towards Atlantic ocean. The next image has one of most glorious sunsets that I ever saw during a flight. It was clicked as our plane was getting ready to land at the Amsterdam airport. It is a pleasure to look down from the plane and see the tiny houses, cars and people as they go about their lives. This image has houses near the Cape Town airport. Houses are the subject of the next image as well. 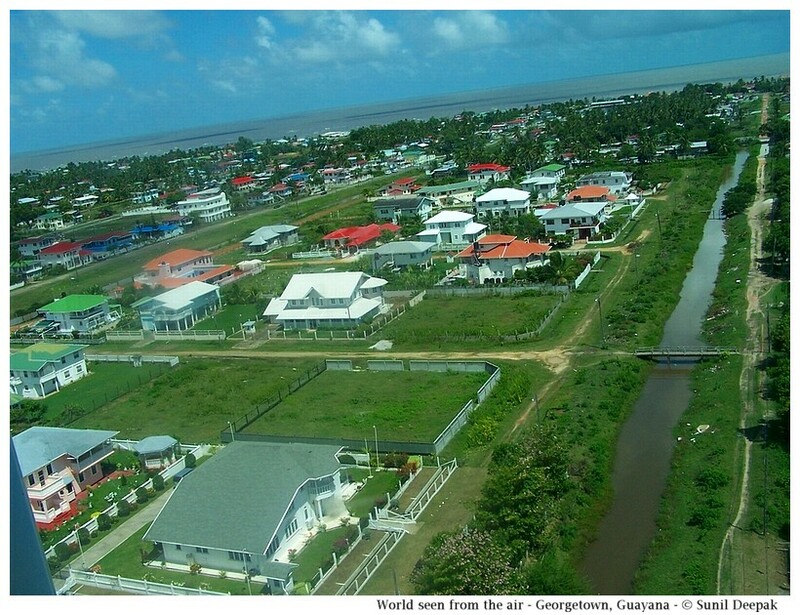 George Town, the capital of Guyana is criss-crossed with canals. This image was taken as our tiny plane had taken off from the city airport. In the distance you can see the Atlantic ocean. The next image of this post is of Como lake in northern Italy, near the Alps mountains and near the border with Switzerland. Como is the most famous city situated along the banks of this lake where many rich and famous persons including George Clooney, Madonna and Sylvestor Stallone have their holiday homes. The Y-shaped lake is one of the deepest lakes in Europe. The next image is from Almada in Portugal. 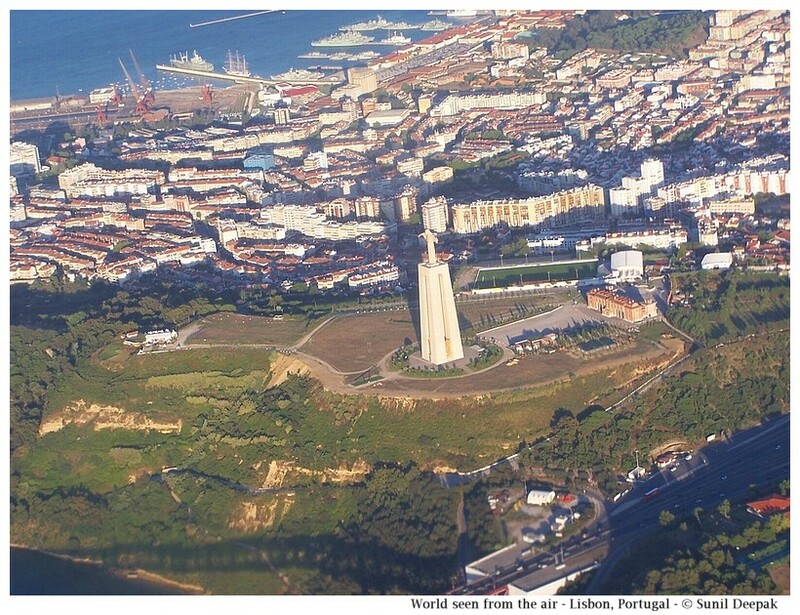 In it you can see the Christ King sanctuary near the 25 April bridge which crosses over the sea and connects Almada to Lisbon. Flying over snow-covered mountains on a clear day is a special joy. While crossing the Alps, I remember different journeys when it was impossible not to gaze wonder-struck at the beautiful panoramas. The image below of the snow-covered Alps is from one such journey. In Nepal, I never had good views of the snow covered Himalayas. 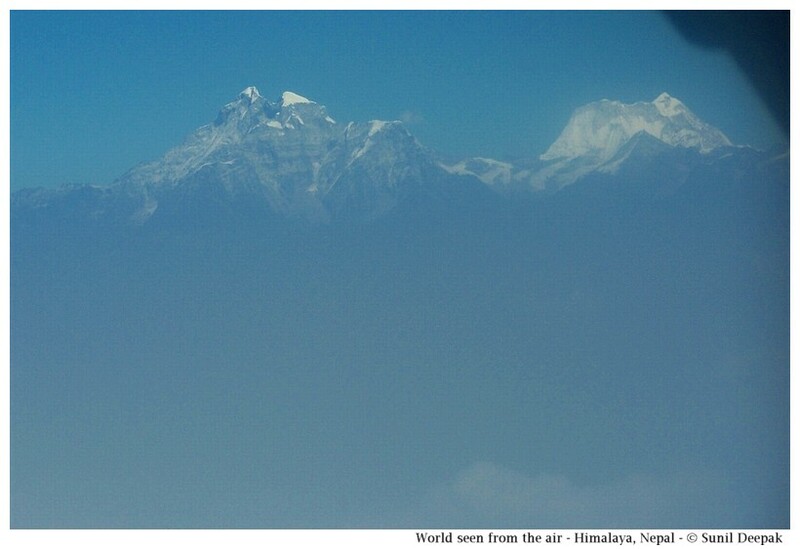 However, during one journey, for a short time we saw Everest, as the peak appeared above the clouds. The next image has a picture of the Kunchanjanga peak. The next image was clicked while travelling from Vienna in Austria to Prague in Czech republic. I was fascinated by the neat fields with some of them in bright yellow (due to some flowers), that looked like a beautiful carpet. I want to close this post with an image of Bologna. For three decades, we lived in Bologna, close to the airport. Sometimes, the flights passed right above our house. Yet, I never managed to click a picture of our home from air. Among all the images of Bologna, I have selected one showing the highway exit to the trade-fair zone. Over the past thirty years, air-travel has changed completely. Often old, tiny airports have been replaced by new, shining and modern structures. One of my most terrifying journeys was in 1992 in a tiny two-seater plane in Santa Cruz (Bolivia), where it was raining hard. Our plane had tried but had not managed to take off and we had come to a screeching stop in front of a tree. I can still remember my nausea due to fear on that day. I did not have a digital camera till 2005 and I have no pictures of most of my memorable journeys. Those journeys live only in my memories. Let me close this post with an image from the periphery of Prague in Czech republic - the buildings in this image remind me of things children make with Lego pieces. Loved the beautiful post. Thanks for sharing amazing pics. Great to saw top view of Saraighat, Brahmaputra river.